What makes a successful Public Private Partnership (education) model? Since the creation of modern education systems, the private sector has been involved in education activities even if political factors, resources available and local traditions have influenced the role that the latter has played. Religious schools, education entrepreneurs, families or community organisations have participated in activities of provision and funding of education across India. However, new arrangements between the state and private actors are emerging in the education field, often introduced under the umbrella of Public Private Partnerships (PPPs). Abstract: In the first study using a randomized experiment to measure the impact of school vouchers on college enrollment, we examine the college-going behavior through 2011 of students who participated in a voucher experiment as elementary school students in the late 1990s. We find no overall impacts on college enrollments but we do find large, statistically significant positive impacts on the college going of African American students who participated in the study. Our estimates indicate that using a voucher to attend private school increased the overall college enrollment rate among African Americans by 24 percent. There are few areas where the difference between what Indians want for themselves and what the government of India wants for them is more alarming than in higher education. Six to eight hundred thousand Indians leave for foreign universities every year. Yet foreign universities are not allowed to set shop in India. NEW DELHI: Finding faults with the education system in India, an educationist with a New York-based university on Monday advocated the need for a change to allow freedom of creativity to promote innovation. CHENNAI: Tamil Nadu has not even met half its targeted number of admissions in matriculation schools for the 2013-14 academic year under the 25% reservation clause of the Right To Free and Compulsory Education Act. At the beginning of the 2013 school year, the Los Angeles Unified School District (LAUSD) implemented the first phase of a $1 billion initiative to provide an iPad to every student and teacher in the city's public schools. The program was intended to help "close the digital divide" between the rich and poor while meeting federal Common Core technology standards. But the project has been heavily criticized, and many of the participating schools have halted home iPad use. Four years since enactment, has the Right To Education made education in India any better? 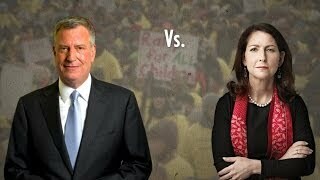 The mayor has a vendetta against charter-school leader and former political rival Eva Moskowitz. Watch this video here.